Midnight Bisou is living proof that you don't need to spend an arm and a leg to buy a Grade 1 winner. Dominating victress of the G1 Santa Anita Oaks on April 7 under jockey Mike Smith for Bloom Racing Stable and Allen Racing LLC, the 3-year-old daughter of Midnight Lute is the fourth lifetime G1 winner for her trainer, William Spawr, a respected California horseman who has spent the majority of his career saddling claiming horses. Spawr's most recent G1 winner before Midnight Bisou was Amazombie, the 2011 Eclipse Award winner as outstanding male sprinter. Bred in Kentucky by Woodford Thoroughbreds, Midnight Bisou has now won 3 of 5 starts, with two seconds (both were nose losses to G1 winner Dream Tree). With her Oaks victory, she became just the second three-time American Graded Stakes winner of 2018. 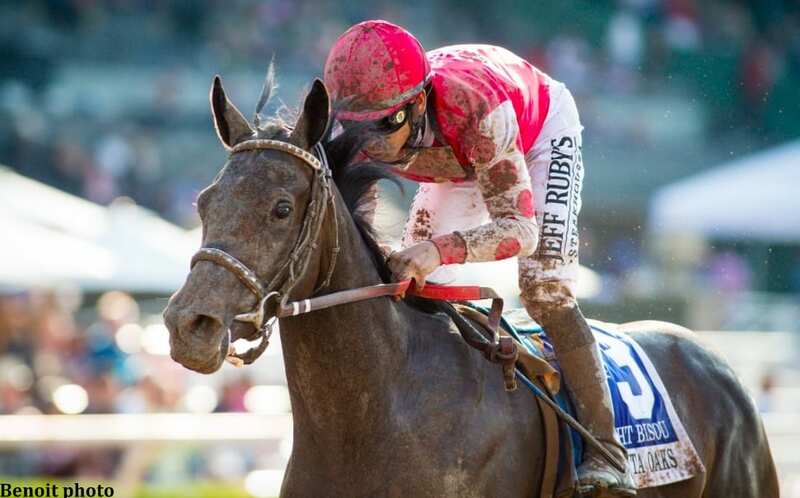 Her previous wins came in the G2 Santa Ynez on Jan. 7 and the G3 Santa Ysabel Stakes on May 3. Midnight Bisou was consigned to the 2016 Keeneland September Yearling Sale by her breeder, landing in the 12th session of the 13-day auction. She failed to find a buyer, and was bought back by her consignor for just $19,000, despite being produced by the G3 Florida Oaks winner Diva Delite, a daughter of Repent who had just two previous foals of racing age. Woodford Thoroughbreds then brought her to the OBS April Sale of 2-year-olds in training, where Jeffrey Bloom, as agent, bought her for $80,000. She has now earned $450,000 and is one of the leading contenders for the G1 Kentucky Oaks on May 4 at Churchill Downs. This entry was posted in American Graded Stakes Standings and tagged allen racing, American Graded Stakes Program, bloom racing stable, Keeneland presents American Graded Stakes Standings, keeneland september yearling sale, kentucky oaks, midnight bisou, obs april sale, Santa Anita Oaks, william spawr, Woodford Thoroughbreds by Paulick Report Staff. Bookmark the permalink.